Decor Floors is offering discounts and deals on flooring material in Brampton, Ontario. Visit the best flooring store near you today! 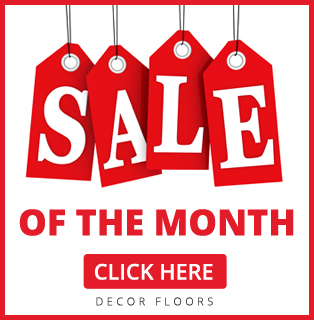 With weekly special offers, lowest price guarantee, and wide variety of flooring products, Decor Floors is your one stop shop for all your flooring needs. In Brampton, we feature an elegant showroom that majestically showcases a plethora of high-quality floors such as Hardwood Floors, Laminate Floors, Vinyl Floors, Carpets, Area Rugs & Runners, Bamboo Floors, Tiles Floors and Marmoleum. You can now get cheap affordable, quality floors at Decor Floors Brampton. With more than 20 years of experience to our name, our reputation for value and service has grown steadily. Our international and domestic supplier include Armstrong Flooring, Bruce Flooring, Shaw Floors, Karastan Carpets, Mohawk Floors, Shnier Flooring, and Somerset along with many other top flooring brands. If you require an experienced hardwood floor installation in your home, office or commercial property, call us today! We regularly work with interior designers, contractors, realtors and builders. Our professional staff will help you get exactly the type of flooring you desire at a price that is below our competition. Our staff is well equipped to handle any and all questions or concerns you may have. Visit our Brampton flooring store today!